Eat Your City: Prosciutto wrapped asparagus, bacon wrapped asparagus… its asparagus season! Though usually available year-round shipped from all over the globe, its full on asparagus season April/May till about July/August. You get the sweetest most crisp and nutrient rich fruits, vegetables and meats when you purchase them in season, and asparagus is no exception. Yes, it makes your pee smell funny, but when its packed full of nutrients (folic acid and potassium), fibre and natural sugars that you can bring out by grilling or roasting, colorful (they come in green, white annnnd purple… yup… purple! Baby, bring these tasty little spears on! 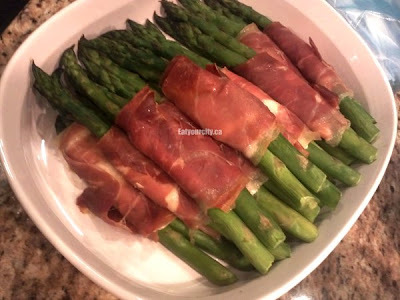 I usually steam, blanch or grill asparagus and served with a little bit of fresh lemon and butter… but for potlucks or when I’m in the mood, I steal my girlfriend Kathychee's awesome and super simple recipe for crispy salty nomnomnom bacon or salty-sweet prosciutto wrapped asparagus. Feeling guilty about bacon? 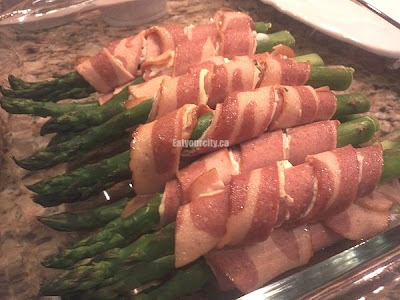 Turkey bacon wrapped asparagus! 2) Spread a smear of cream cheese (use plain or mix it up with a flavored cream cheese) down the midsection of the asparagus – or if you really love cream cheese, spread it down the length of a piece of bacon (regular, thick cut, or even turkey bacon!) or prosciutto cut into 1 inch strips – careful, prosciutto tears really easy, though cream cheese "glue" is very forgiving! 4) Bake in preheated 450F (230 degrees C) oven for 10-15 minutes, flipping over about 7 minutes in so you get a lovely crispy sides all around and its done when the meat is crispy and the asparagus is fork tender when you poke it... with a fork. If you really love your bacon super crispy, finish with by broiling on high for 3-5 minutes – only do this with bacon (especially turkey bacon as it tends to cook up less crisp than regular bacon), do not broil the prosciutto wrapped asparagusunless you want charred prosciutto!! 5) Watch these babies disappear like magic! Nom!